Releasing Premium Magazine Style Blogger Template "TURN OUT MAG"
FREE Premium Magazine Style Blogger Template " TURN OUT MAG "
Over the last few days, so many readers commented on this site asking me to convert a Magazine style wordpress theme to Blogger version... So, for all you guys.. 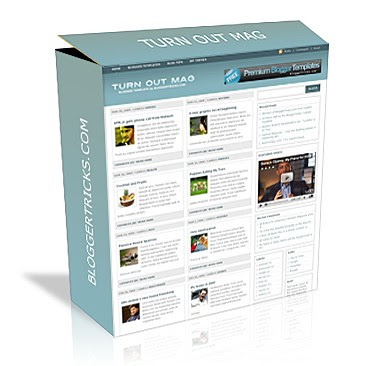 Releasing Premium Magazine style Blogger Template "TURN OUT MAG". This was originally a wordpress theme designed by ChiQ Montes and I converted it to Blogger version. Step 0: First, follow the Basic Template Installation steps here. 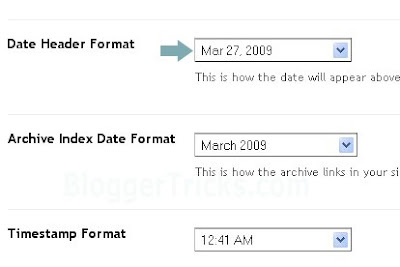 Step 1: Go to Settings » Formatting and select the Date Header format like the one shown below and Save the changes. Just look at the code.. You'll understand. Got it? 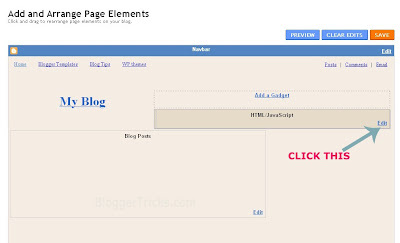 Just replace the Anchor text (Blogger Templates, Blog Tips, WP themes ) with the corresponding links. and paste you adsense code in the box and Save it. Next, upload the image to any image hosting services like Photobucket, Tinypic,etc and after uploading, they will give you a direct link to that image file. Go to Layout » Edit html and find this image url in the template code..
and replace it with the one you uploaded and Save the template. Don't forget to edit the YOUR-FEEDBURNER-URL with your feed address..
can you please tell me where to add a "share this" or "Addthis" button, and also a Digg button. I want the "share this" button to appear at the end of the post and the "Digg" with submission capability at the top on the main post page. thanks a lot in advance. First go to addthis.com and select the button shown below and get the html code for that button. The digg option is already there in the sharethis widget..so, if you add digg button again,the homepage looks crappy. Where can i download the .psd file (PhotoShop) to change it? What is the font of "TURN OUT MAG"? When i try to edit it in photoshop, that Font changes, Thanks. Hi, You can place Ads by Google where ever you want..
You can place in the header (like I showed in the Installation steps above) or IN the Big sidebar .. or Anywhere in the small two sidebars below..
Hi, The .psd file is in the download file itself. Or If you have any problems, let me know your 'site name' and description.. I'll change it for you! Hi, actually, I don't know what font it is.. You can user whatever font you like. hi! how about the feed in the upper left corner, how can I edit that? thank you!!! I answered you question in the post... look at it! Wooow,Looks great and good features too.Thanks so much for your time.And the install guide is also great! Wow. The best I have even seen :D - Twitted it for you. Very nice theme indeed. Hey....thanks...actually I want to edit the colour of the header (if it's allowed? ?..and how??? hehe...) and also I want to know how people can get update THE COMMENT on the blog by feed?? Well done bro.. good work! thanks again man!!! how about my header and description?! could you please help me too..
description: your online source of free tv online streaming such as tv shows, anime, movies and spaghetti sauce.. The description is a bit too long. I shortened it a bit. I found Something and it's making problems for me. blogger tricks rules!!! thank you so much!!! Yes.. that feature is already there.. but it will only show if you have more than x posts. x= the number of posts visible in your homepage. Oh..yea.. I checked again.. Problem fixed.. thanks for notifying me..
Can you download a fresh copy and check again..? Thanks for the new excellent template and for described installation steps . I am bloggertricks follower on twitter. Hi Kranthi.Great template.So much so am planning to remove the template on my primary blog which I put after loadsa hard work.lol. I have one little problem.I want this image http://i43.tinypic.com/15rz5ug.jpg to be on the header instead of text,how should I alter it to make it blend with the background of the header?Thanks. Hey good hard work!! I like it! can I post this template into my blog?? wow! thank you! I've been looking everywhere for something like this! Thank you for another excellent design! How can I get the time of the posts to show, so I can establish when I break stories? Hey, Thanks for the great template! One question, if I may; the ShareThis widget is not working on this template. Any ideas anyone? Thanks Kranthi but I think the logo didn't click well for me.So if I could just have the title "Crazy4Footie" and the description read "90 Minutes on the Pitch"
I'm having 2 problems with my installation. One is the older post and newer post links showing up on the home page. The other is every 5th post is by itself. I thought it may have been the spacing but I played with it and got the same results. It has to something with my settings I just don't know which on. Could you check it out and give me some feedback on what to do. Thank you so much. 1st : I think you downloaded the previous version of the template.. that's why the older page links not showing up on homepage.. I updated the template yesterday..
2nd : Yea.. I think.. that's due to the non uniform labels.. See..the labels line... for some posts it is one line and others it is two lines..that's why it is showing not correctly. Try to decrease the labels to fit in one line or add more labels to other posts to make all two lines..
BTW, I like your blog.. good job! You're beautiful, thanx for the template. My best blogger theme sofar,maybe,I will abondon wordpress blog. Thanks. For #2 I just removed the labels part of the code. That evened everything up. For #1 I'll compare the 2 codes and change what needs to be changed to get it right. Thanks again for the help and the compliment on my blog. For example, if you post 3 posts today, the date header is only visible for the first post... letting the visitors know that the other two posts are also posted today. If you post one post a day.. the date will be visible for all the posts. I know but in this template it looks a lil' bit awkward... is there any way to fix this??? this is a very very very nice template.. but what happened to my blog?? pls help me... ... thank u so much!!!! Look at this pic and replace the code in blue with the one in red. but that gave timestamp there... actually want I want is this... if two posts are made on the same day, the date appears on both the posts.... is this possible? Two, I have tried to save the code for all of my blog widgets. But when I click 'edit', I am not given the option to convert to code. How do I do that? This is awesome! Just what I'm looking for so long, really fit to my blog. Q1: Is it possible to make the date and the label in two lines instead of one so it all fit perfectly without change the label? Q2:I've tried to enter html code on the add column (img, same size) but it won't show up. How to fix that? i just have a few questions..
when i clicked older post, the boxes doesn't appear anymore? instead there's just a plain text? why is that?? 1. is this done by default or need manual work? 2. what if a post that reside in two labels or more, will that be distinguished based on title? You have to set the timestamp format in Settings > Formatting. Don't worry.. It works.. BTW, I updated the templates with Auto Thumbnails and Auto Post summarize.. check it out! See the rahulnever2far comment above. Clear all the cookies and restart the pc and try again! That feature added, check it out! That's a hack.. which will the very useful if you have tons of posts in the label pages..and avoid duplicate content for search engines. and to add recent comments..
and give the feed url " http://yourblog.blogspot.com/feeds/comments/full "
do the same but give url " http://yourblog.blogspot.com/feeds/posts/default "
First of all thank you very much for this great template, and the updates. I have manly the following problem. or any others Gadgets, and I save it, the most times they do NOT appear complete in the 2 parallel siedebars. If I change to the above siedebars they appear. really? that's a hacK?? wow!! coool!! lol! thank u very very much!!!! thank u!!!!!!!!!!!!!!! Thanks for the updated template! I had a problem with the entire text of the posts showing on the home page - now everything looks neat! I got what you said... thanks for helping me out! Hey this is a great template. I just have 2 questions. 1- My blog has 4 guys writing. So it´d be cool if when each of us posted, the name of the author appeared. Can you tell me how that can be done? 2- I´d like to erase "read more" on the home page bellow the summary post and leave only "comments". How can i do that? 3- Is there any way to erase the small image when we open the post page? I really do LOVE this template...Love!! My first question is my post summary pictures are different sizes, which I think are messing up the alignment of the boxes. What can I do about that? I'd love for them to look uniform like the demo. Also, when I click to edit the "Recent Posts" and "Recent Comments" gadgets, I get a blank screen. I already put the in these two gadgets with the "add a gadget" option. So all I really need to do is remove the blank ones. But I can't. What can I do? ...Did I mention that I LOVE this template??? My blog is www.proactiveblackparenting.blogspot.com. This is really great and well done. I posted a link on my blog. Thanks! I didn't understand what's the problem is.. Can I see your blog..? I visited your blog and I'm pretty sure that you are using the previous version of the template. I updated it a couple of days ago.. read this..
Nope..the template is pretty clean.Don't worry about that..
You can delete those widgets from the 'edit html' undert 'layout' tab. I'm sure that you are using the previous version of the template.. I updated the template two days ago.. read this..
hey how can you this template? im very happy and really grateful to you. can you make any widget who shows recent posts of any label with there thumbnails. i hope you can do this. anyway, how can i change the text font color..? This is my Blog: http://talinbrezmes2.blogspot.com/ (it is my test blog, I don’t like to change the template before everything works perfect). The problem ist that, as you can see, you can’t the last 2 Gadgets of the 2 last Sidebars. You have to go with the cursor on it, and then you can see only a part of them. how can i make page of labels same as in SchemerMag. this page show posts with thumbnails. i don't know why, but after I open for all publics the Blog, all my Problems were solved. nice instructions. very comprehensive. thk u very much. after seeing this i got an idea to start another wordpress blog. thks alot man..
how can add social bookmark ?????????? So great, thank you, you're the best. Can i have it again, plese. Kranthi, I am using your template and found it easy to implement for such a sophisticated look. Thanks! Only one problem: below comments Home and Previous post and Next post appear twice. I think this is because of tweaking I did. Hi, just a quick question, the top bar, you know the aqua background, could I change that to my own image? The template is awesome, I just wanted to incorporate my own colour schemes. I am trying to update the old version as you advised. I made the first change. But I cannot find the html code that needs to be replaced in the second change. Is it possible my version does not have this at all? How do you divide the first paragraph from the rest of the post. When I tried to use this template, I got my FULL post shown in every space, bugging the "boxed" design. Hope you can gimme a hand. Great template, really what I was aspiring for. But I have one problem. I Have only one block seen on the home page. only the recent post page. how can I set my other last posts in different blocks? the home page is not showing the number of labels i.e. the same no. of blocks, plz help me!! Thank you once agains Kranthi! "Normal 0 false false false EN-US X-NONE AR-SA MicrosoftInternetExplorer4 ..." in each block and no content is seen except image. Plz visit and see and suggest. Please see my blog filmtaka.com, the homepage did not show post summarize properly in columns. i hope you help me. I didn't tested it before..maybe that automatic post summarize don't work with other languages. You are right but it is runnig well on Internet Explorer and showing error on Firfox browser. Is it not possible to add one more feature that would make this template par excellence. It is possible these links may be shown on as like blocks in the home page? You have rightly taken your display-name as Kranthi (revolution) in the arena of Blogging templates!!! Plz also tell me how can I change the colour of the text into dark black. It seems to me that the default colour of the text is dark greyish. And how can I change the colour of the header? i hv one question & one suggestion. Q. when any one click on older post then post shows as a simple format not like homepage boxes format. as there any option for older post? suggestion. you did such a thing which is awesome for blogspot users specially for me becoz i shifted to wordpress , suggestion is tht you make this temp like wordpress but please also add pages option. I want a header from you if you can do that for me . Please upload and give link here . I will gladly appreciate. Thanks for this theme, really liked it. If possible can edit for me ? Really sorry..that I didn't responded to you soon.. as I'm busy with some other big project..and also studying for my exams next month. Thanks a lot mate , Really appreciate your work . sorry butI can´not find the logo adress to chage it. Could you saidme where is it? i like your template..now i used it.but i dont hv photoshop.Could you edit for me? Description:Talk about tips and tricks of blogging, entertainment, lifestyle, software and world famous blogger. I love this template and would like to use it, can you edit the header photo for me please? Wow, this has been an amazing change for Soul Hacker (http://www.jessewatkins.com). I was trying to add the "addthis" button to the bottom of each post, but the code that the addthis page tells me to look for is not there. Is there a certain code I should be looking for in order to have this "addthis" button on the bottom of each post? Theres one problem wich have been giving me a headache with this beautiful template of yours. I wanted to add a email subscription form, but the configuration of the search form ruins the standart feedburner code. Thank you Kranthi For providing Logo,Btw I too studied in Guntur Butnow in chennai. I NEED to change the headers background colour to all black You said all I would need to do is change the header i did its there but the background is still the same colour. Also is one able to just make ONE huge banner across the top? instead of having one solid color and an ad? Or even better yet a HUGE banner across with the add on top of it? Hi! I'm a brazilian webdesigner and have a problem with this template. My mini-posts don´t have "..."
Sorry, me english isn't good to write, but i understand everything in english. So, you can awser in english, ok?! Thank you so much for converting this magazine template to blogger. Just added it to my high heels blog and I love it. I finished optimizing it with a full banner. im testing your template on a test blog.love it to the max.theres one problem, i want to install other comment system (js-kit,intenseddebate or disqus) but when i did that, the old blogger comment is still showing up.any ideas how to solve this? maybe hide it? Send that code and link to that comment system.. I'll test it out! This is a very nice code and just the one I've been looking for. But i can't edit the logo as I don't have photoshop editor. No description as title is already long enough. Thanks a bunch. btw, send me your paypal id. Iwant to send a gift as gesture of gratitude if you don't mind. How do I add back in post dates, 'posted by', times and options (like Digg, edit buttons, etc)? 1. Search results page: I would like the corresponding thumbnail pic to show in-line with the title. 2. I can't get rid of the "/" before the "Labels" title over post or before the "Read More" at the bottom of the post on the main page. 3. "Older Posts", "Home" and "Newer Posts" is repeating twice on the bottom of the individual post page. 4. I can't figure out how to get my e-mail attached to the link in the upper right corner. Any help you could give would be great. I know that's a lot. (I'm kind of a newbie so clarity is greatly appreciated). I opted for your other layout, schemermag, for my pose page, which solves most of my issues for the layout. Thank you. How do I make a bit more room between posts on main page? Very nice. Thanks a lot! I've installed this template and the feedback that i got is great. thanks a lot man. still awaiting answer to my earlier query. This is a great template. And thank you for offering to photoshop the logo for us. hello thank you very much I like your style template but this dish especially for me as I go instead of me leaving visible 10 articles about 16 or 20 .. I really want to use this but posts are published in its entirety. The expandable post code does not seem to be working. Hope you can help me on this one. Thanks. answered your question in the post.. read it again.. Sorry mate.. both the css are conflicting. i am leaving the blog as it for your refferance to check the problem. You have to change the width and height of the youtube video to fit it correctly. the read more option does not work, it shows me the whole article. What should i do? How do I make the labels/tags appear at the bottom of each post instead of at the top? first of all: great template, thanks. but now a question: id like to use the template on my site, but my language is not English, so i want to translate the words "/ Label:", "Comments" and "Read more" appearing on the post? Where can i do that? and replace those with your language. First of all, Thank You for this wonderful template! I am trying to use this template for an Asian language blog, and therefore have 1 question - how can I adjust the character count before the text gets cut off for "Read More"? Asian characters take up twice the space as Latin characters, so my content always spill out of the boxes on the front page. Any help will be appreciated, thanks again! Search for this line in the template code..
and change the word count values to your needs. Firstly, I want to say THANK YOU for such a lovely template!!! Is it possible to remove text from the front post altogether? I just want to show the image. I really need your help. Thanks in advance! I'll try this again but how do I make the labels/tags appear at the bottom of each post rather than the top? How do i change the template in order to have homepage feel (Thumbnail picture with summary of posting) instead of title of the blog in list format when I click on the categories or label. Can you Kranthi, or somebody would like to teach me how to insert a break so I can include a "Read More"? If I post lots of text, the template can´t handle it and shows the entire post :( thus ruining the wonderful template design. I have the problem because I downloaded the template from somewhere else and it seems that: a) was altered or b) was the old version. Dear Kranthi, I downloaded this theme and uploaded to my new blog.Everything was fine but in the home page those small excerpt of the articles are appearing with the read more option. but the article is not broken but continue...have a visit to my site, and help me in this regard...please. hello Kranthi, well i need a header for my blog i dont have so much money for photoshop but maybe i find something cracked, this is a great template so i want to use it but i need a hader whit my name, like PlayedPodcast so u can help me ? 1st of all I would like to say thnx to you for converting this gr8 template and explaining each step very clearly. I have 2 blogs. Both uses different templates made by chiq montes and converted to blogger by you. Gr8 work and many thnx for the effort. I am having a little problem with this template. The "older posts" etc links doesnt show up on homepage. I checked the above comments which had similar problem. But I have DL the template just 2 days ago only so its the new 1 that you had uploaded. The posts have also increased the no. that is displayed on home page but still the link doesnt show up. It wont be possible for me to DL the template again and check as I have hugely customised the template already. Can you please look at it and suggest what code do I need to change to get the links at home page. So, what's the need of older posts link now..? (because..there are no older posts to display). If you post more posts, then the link will automatically display. And no link to "older posts" is there!! Oh.. when you downloaded the template..? You downloaded the previous version? or You downloaded from other sites..? Can you download a fresh copy and check it in a demo blog..? it only shows 19 posts but there r total 27 can you please help me to solve the problem. Only one problem I have: comments. Comments are activated from blogger's settings. However the 'Post a Comment' box does not appear in the post. Neither does the 'Comments' link appear next to the 'Read More' on the homepage. Any ideas how I can fix this? Well I DL the template from this website only and just 3 dayz before!! or Do you edited any codes in the template? Description is- Bringing you the latest in Fashion, Music, Sneakers & Culture. Here is your logo mate..
And I didn't understand the error in the Graffitiart template.. can you pls tell where you saw the error.. The website garffityart-template.blogspot.com contain elements from the site w3goodies.smaug.cz which appears to host malware. This is a part from the warnning message. i was whit whit 2 browser there to see the template demo and i see this message. Me too have problems like that whit blog catalog what was affiliate whit a bad site and because of this site my blog and blogcatalog have problems. Thanks dude for notifying me.. error fixed.. download a fresh copy and test it and let me know..
Oh..really? I didn't see any message like that from my PC..
Guys.. Good news,.. I'm setting up a Blogger Forum for you guys very soon! with Adsense revenue sharing.. So, you guys earn few $$ from it. u was whit Chrome browser? I tested the template on test blog and the older post link is there. But when we click the link the OLDER POSTS come in LIST view without the thumbnail unlike the home page where the post come in grid view with thumbnails. So I wanted to ask that is it some error or will it remain like that only?? but at the "Contact" tab there, when I click on it, nothing appear..I mean..how my readers contact me? How can I change the whole white background to a textured background? And also how would I add this image on the right side of the header where the adsense AD is, the sheeps willbe on the right and the gradient will fill the rest of the header to the left, and the I will replace the logo.gif with my own? And also how would I add this image http://i235.photobucket.com/albums/ee249/2myhttp/Conspirator-Sheep.jpg on the right side of the header where the adsense AD is, the sheeps willbe on the right and the gradient will fill the rest of the header to the left, and the I will replace the logo.gif with my own? I don't have photo shop will you do the header done for me. I want to upload the external js code to my own page, (just thought that might be more stable and faster to load the page) could you tell me where I should insert the code? Do a search for 'myblogtalk.com' in the template.. and You'll find the code. I already explained in the post how to add social bookmark buttons.. read it. Kranthi, I have the code, just don't know where to insert it.... I did actually try to insert it at the thumb&summery widget, and above the body....but either of them worked. Hi Great template thank you. Below the summarised blog posts there is a lot of white space. Is there a way of adding a gadget setion below the blog posts? I don't know editing the .psd file and I don't have photoshop. My sitename is "Bemdamores" and my description is "mesmo assim, também me safo bem no jogo" . Thanks! I tried tred the 'Add This' code fix, but for some reason the button show up beneath the post box and not beside the Read More /.